Fairy Moths Archives - What's That Bug? Currently viewing the category: "Fairy Moths"
I am an amature photographer and love to do maco photography of insects. Last may (2016) I took the attached photo of a flying insect landing on a very small white common daisy. The enclosed picture is modified only sparsely. The iridescent sparkle of the insect I found to be fascinating. It was in the soft sunlight and the colors have not been tweaked– only enhanced slightly. I have it labeled as a mayfly–which I realize is incorrect. The insect was found in Oregon near the Oregon coast at a rest stop on the way to Astoria, Oregon. The date was May 15, 2016. And why the long antennas? The plant is a cow parsnip, if that helps. What an exciting photo submission. This is a Fairy Moth in the family Adelidae, a very underrepresented group on our site. We believe we have correctly identified your moth as Adela septentrionella based on photos posted to Bugguide, which states: “Adult – forewing purplish-black with two incomplete thin white bands about one-third and two-thirds distance from base; may also have white spots at apex; head black with bushy tuft of erect hairs; antennae of male at least twice as long as wing hindwing uniformly dark with wide fringe. Per comment here ‘The Moths of Western North America by Powell and Opler, p 40, states that the orange scales on the head indicate a female in this species. 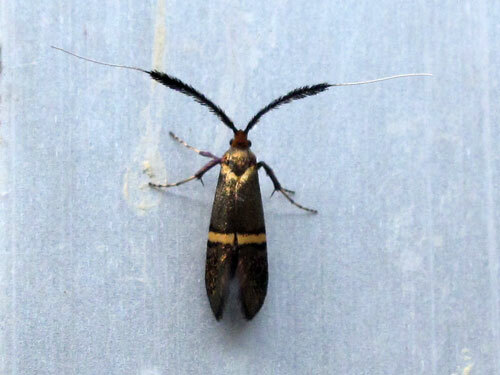 '” No reason is given for the extreme length of the antennae. Antennae are sensory organs in insects and males often have more developed antennae to help them “scent out” the pheromones of the females. Have a number of very strange flying insects on our ceanothus in our garden in Robiac, about 1000 ft up in the Cevennes mountains (S of France). It is around 4mm in length with a bronze coloured wing case with a single transverse (white?) line across the wing cases about 2/3 of the way towards the rear. The principal item of note however, is that when in flight it extends its antennae at right angles to its body and these are almost 3 times its body length. Not elegant in flight but sort of judders about. This moth bears a striking resemblance to a North American Fairy Moth, Adela trigrapha in the family Adelidae, so we tried to search French members of the family. We quickly found Papillons de Poitou-Charentes and a similar looking species Adela croesella. There is a note that it flies in May and October, so your sighting is timely. The species is also found on UK Moths where it states: “Distributed locally throughout England and Wales, the males of this species have very long antennae, the females shorter with a thickened base. The moths are on the wing in late May and June, and fly during the day in sunshine, visiting flowers. The larvae are thought to feed at first on flowers of sea-buckthorn (Hippophae rhamnoides) or privet (Ligustrum vulgare), later building a portable case from leaf fragments and particles of soil and feeding on leaves which have fallen.” According to BugGuide: “Small moths with very long antennae (3 times as long as forewing in males, and 1 to 2 times as long as forewing in females); basal half of antennae hairy in females. Holarctic and Neotropical species (Adelinae) are diurnal and often iridescent, with white antennae.” This is not a well represented family on our website so we are very thrilled to include your photo in our archive. Funny Looking Bug or Beetle? Our first thought is that this must be a Moth, though your photos do not really show the mouthparts well enough to be able to say for certain. Fairy Moths in the family Adelidae (see BugGuide) often have weirdly exaggerated antennae. We cannot really find a match on the Thai Microlepidoptera page. Netwing Beetles mimic moths, and another possibility might be a Caddisfly or even a Hemipteran. We hope one of our readers can supply an identification. This Thai Bugs website seems like a good place to start, though we had no luck. hi daniel, thank you for the tip. now that you mention it it does look like it could be very fancy moth. I think I have seen those feathery legs on moths. I will go thru the moths before I rule them out. when I track it down I will send it in w proper ID. It would be awesome if you let us know in the event that you manage to identify this critter. You might also want to provide a comment on the posting of your letter, because six months from now, someone might write in to us with an identification and then you will also be notified. I have an orchard in a rural part of Northern California. This weekend there were probably a hundred of these small black and white butterflies or moths darting around. They have insanely long antenna which seems to make it difficult for them to fly. Can anyone tell me what they are? This is a Fairy Moth, probably Adela trigrapha, which may be viewed on BugGuide. I photographed this insect in April of 2009 in the Maguire Peaks area of Sunol Regional Wilderness, near Sunol, California. The wings make me think moth, but the antennae, butterfly, and the head, fly. This is a Fairy Moth in the genus Adela. It bears a strong resemblance to Adela trigrapha as pictured on BugGuide. The species is reported from California and Oregon and the flight time is April.